Meet our fifth Grateful Teacher Winner, Marsha Clark! Mrs. Clark has been teaching for forty years, including the last several years as an assistant principal. She is well loved by her peers and takes great pride in encouraging teachers to reach their full potential! Mrs. Clark was my fourth grade teacher and it was in her class I earned my first B. I learned then that teachers don’t give you grades, you earn grades. That in itself was a hard, but valuable life lesson to learn at such an early age. She taught me that you always put forth your best effort and never take the easy way out. She taught me to treat others with respect and kindness, no matter how they treat you. She taught me how to be a teacher that cares and inspires her students. Because of her impact, I am the teacher I am today. Life has come full circle with her being my fourth grade teacher and later on my assistant principal, but more importantly my lifelong role model. She has touched countless lives and I am forever grateful for the impact that she had and still has on my life today. As I stated in my application, Marsha Clark is one of those teachers that students will always remember. Mrs. Clark has positively impacted more lives than can be counted. She’s like the Energizer Bunny….she just keeps going, and going, and going. I’m so blessed and thankful to have not only sat as a 4th grade student in her class, but to have also been a colleague under her leadership. This is such a heartwarming story! 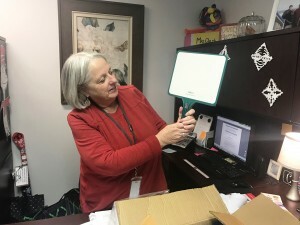 We are so happy that Mrs. Clark will be able to share her KleenSlate whiteboards with her students and fellow teachers. We are all truly blessed to have mentors and leaders like Mrs. Clark!